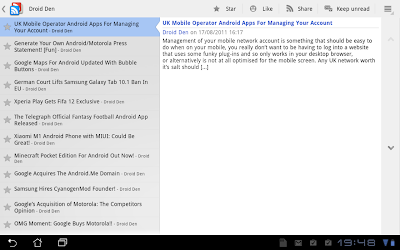 The official Google Reader Android app has justÂ receivedÂ an update in the market. The update adds some new transition animations between articles, as well as providing support for tablets running honeycomb. The app is actually quite nice on the 10.1" transformer, and I might even go as far as to say it's my favourite honeycomb reader app! The same still can't be said for the phone version of the app, in my opinion there are still much nicer phone reader app available. Grab the update from the android market here.